Another lead track originally featured on G8's superb debut artist album "Mine Is Bigger Than Yours" gets the full single release treatment and rightly so! A full on techno groove, chugs and growls through the gears in glorious style. The addition of a brand new Drama remix is the icing on an already very sweet cake as this genre busting artist continues to show us just what a mnulti talented dance producer he is!! 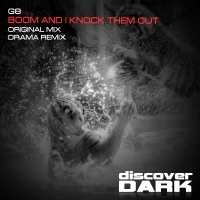 'Boom and I Knock Them Out' is available now from Beatport and iTunes.